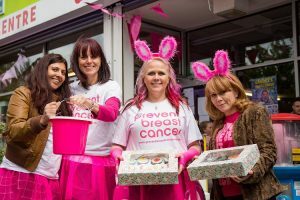 As we catch our breath after the gigantic success that was Paint Urmston Pink 2017, we’d like to take this opportunity to thank all those involved – both during the Pink Artisan Market on April 1st, and then on Easter Saturday. 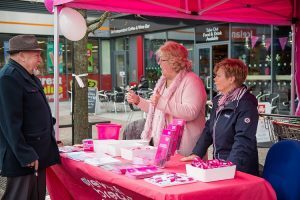 At the beginning of April, Urmston Artisan Market wonderfully decided to stage their own event to really kick off the fundraising by turning the market, including even some of their produce pink in support of the charity. If you’ve ever wanted to eat a pink scone, whilst drinking pink fizz, at the same time as being served by someone in a pink tutu – then this was your chance! Then on Easter Saturday, we held a one day extravaganza, with music provided by Wayne Devlin and the Sweet Rhythm Big Band and as it was Easter Weekend, we were treated to a giant inflatable egg that smelled of chocolate, provided by entertainment company Messages PR. Various businesses then throughout Urmston flew our special pink bunting, and held special pink days, including raffles, the selling of special pink treats, and even creating their own special charity cocktails. We even had thirty Trafford Police Cadets bag packing in Sainsbury’s. We offer our sincerest gratitude to all the businesses and individuals who supported Paint Urmston Pink with such vigour, and we couldn’t be more delighted that the people of Urmston really got behind the campaign and were so passionate to support our cause. It truly was magical to see the town swathed in pink. We’re delighted to announce that just under £5000 was collected, which is absolutely fabulous! So a HUGE thank you to the people of Urmston for such wonderful support.